Earth vs. the Flying Saucers is a 1956 release directed by Fred F. Sears. This black and white movie is a typical 1950s American science fiction film, revolving around alien invasions. Operation Skyhook is set up to probe into future space flights by launching rockets in the upper atmosphere. Strangely, all the rockets disappear. Dr. Russel Marvin, heading the Operation Skyhook, along with wife Carol Marvin, who also happens to be his assistant, are abducted by a flying saucer. The aliens trick them by demanding to meet specific people in order to negotiate, when their actual intention was to kill them. Scientist Russel and Carol devise a weapon to counter the aliens, who have advanced powers. The movie revolves around them trying to find a way to stop the alien invasions and save the human race. The film's special effects are memorable, especially when compared to its contemporaries in the 1950s. 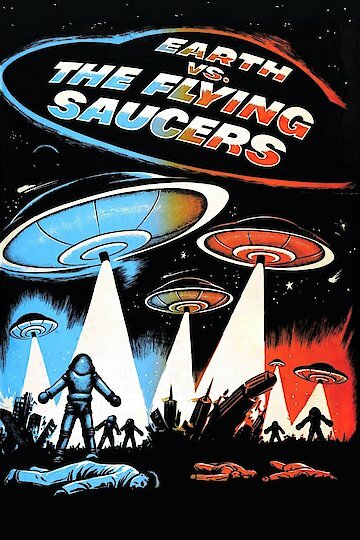 Earth vs. the Flying Saucers is currently available to watch and stream, buy on demand at Amazon, Vudu, Google Play, iTunes, YouTube VOD online.